I found this postcard in an antique store in Indiana. I’ve not seen anything like it in my limited searches. It appears to be a US manufactured King armored car. The King Armored Car was manufactured by the Armored Motor Car Company (AMC). It was the first American armored vehicle, and was ordered by the United States Marine Corps in 1915 for testing before being used by the 1st Armored Car Squadron, which consisted of eight cars. The 1st Armored Car Squadron was the USA’s first formal armored unit. Wiki Source picture below. My card is post marked post-war 1919. The writing on the back is in pencil and quite faded but it appears the card is addressed to the Ford Seed Company, Rivanna, Ohio. The sender is Louis Evans and Louis is requesting a seed catalog. The importance of the automobile in the present war can hardly be overestimated. At the beginning of the war, a fleet of Parisian taxicabs enabled General Joffre to get his troops mobilized at the proper point with incredible speed. Again and again the motor car saved the day, but here in the armored machine gun car, we wee the automobile in all it’s glory of war. 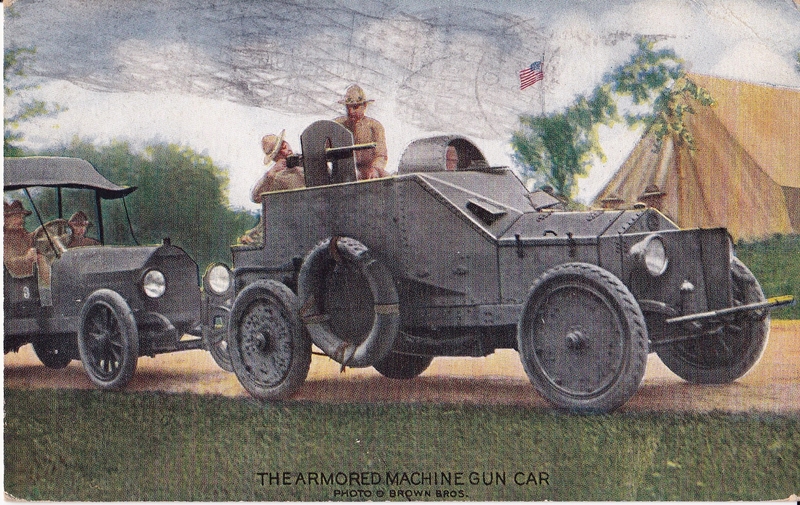 Note the sturdy construction, solid wheels, steel shield for the man who operates the machine gun, and the small carefully shielded apertures through which the driver can watch the road and still be comparatively safe from hostile sharpshooters. 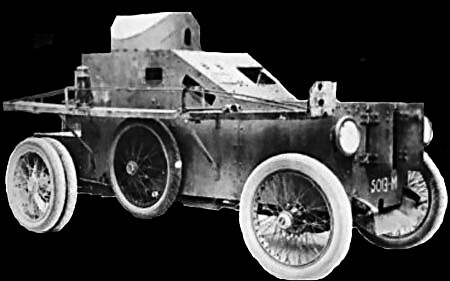 Although other nations used armored cars in combat in the First World War the Us manufactured King did not according to Wiki. The squadron was disbanded in 1921 and some of the cars sent to Latin American countries.